Bright and breezy, S/V Au Soleil holds true to her name. The wrap around windows of the salon allow one to constantly take in the beautiful surroundings. A great boat for families or couples who want a cozy modern home away on the water with plenty lounging space and relaxed vibes. Features 2 forepeak cabins where child or small adult can sleep to accommodate 7 or 8 passengers. The aft staterooms with en-suite bathroom have queen beds, 6´6´ headroom and individually controlled air conditioning. Optional Accommodations: 1 airconditioned forepeak single cabin, for e.g. a child. Captain is all-American swimmer, lifeguard and water safety instructor. Can give swimming lessons if needed. Parents at all times responsible for safety of their children. Captain is not certified sailing instructor but is happy to teach guests the basics of sailing. Brian began his passion for life on the water growing up in sunny California. He spent his childhood summers on lakes learning all about power boats from his father and as a teenager was exposed to sailing and he then knew that sailing would be his lifelong vice. After graduating Chico State University with a major in Hospitality and Special Events, Brian moved to San Diego to be closer to the water to allow him to continue sailing on the weekends. He soon realized that two days a week on the water was not enough so Brian quit his job to finally pursue the sailing career he really wanted. Brian has extensive experience chartering on power and sailing yachts ranging from 30-50ft in the Caribbean, Aegean, Adriatic, Irish, and Atlantic Sea. Aside from learning the ropes of sailing with Brian, guests of all ages can look forward to a swimming or wake board lesson or two from the legendary instructor himself as well as snorkeling, fishing, paddle boarding and kayaking while on charter. Alex was born in Toronto and raised in Philadelphia, Alex learned the ins and outs of sailing from her father and grandfather on the North East Coast and on the Great Lakes. Cooking was always a family past time, but after graduating from the University of Toronto with a degree in Anthropology in 2015, Alex moved to Italy to learn more about the Italian culture, but most importantly, the food. After working in restaurants in Florence, Alex knew that she could never move to a corporate career and began to search for the perfect combination of cooking and adventure. Raised in a sailing family, Alex has seen the good, bad and ugly of sailing and chartering but still fell in love with the lifestyle. She began working charters as a yacht hostess in the Adriatic Sea in 2016. Three years later, and fast forward three years, Alex is a globally experienced chef having worked aboard sailing yachts cooking and hosting all over the world from the East Indies to the Caribbean, with no end in sight and no plan to slow down. A week or a few days on board Au Soleil with Brain and Alex will no doubt be your best vacation ever! 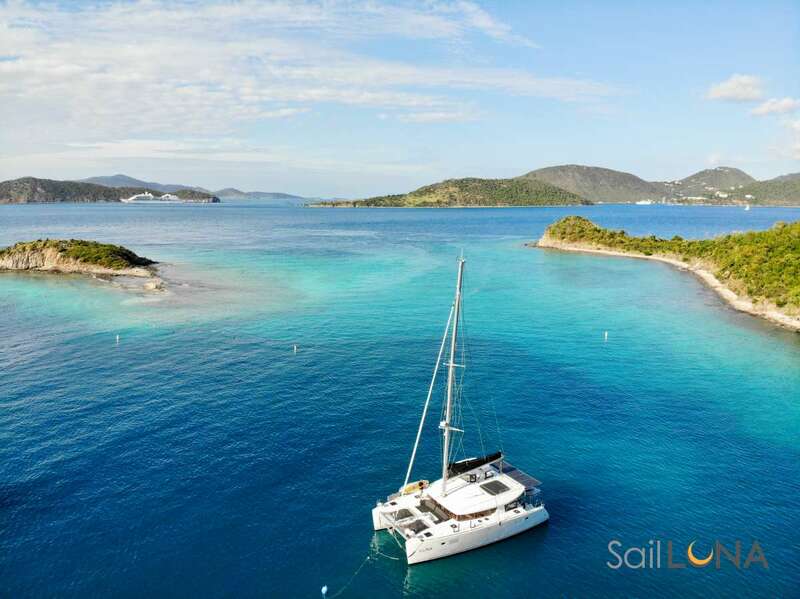 Offer: Au Soleil is offering a 5% discount for any charters booked for the summer - May - July, 2019. Send us an inquiry to get specific pricing for Au Soleil. Just wanted to drop you a note to tell you we had a wonderful charter on the Au Soleil with Brian and Alex last week. You got what we were seeking and matched us to the right boat and crew. Suggesting we extend the sail from 5 to 7 days was the right call as Anegada was my favorite stop. We had the usual – Will there be enough to do? Can you really spend time a week on a small boat? The crew’s expertise and lack of hassle from airport transfers to clearing customs to water knowledge and spot on dinner reservations made for a memorable trip. We will be plotting future charters and talking the crew and the boat up! This is Your Boat and Crew! Exploring the US and BVIs on Au Soleil with Brian and Alex was truly fantastic. The boat is immaculate and comfortable with abundant areas for sun and shade. The crew is vigilant about ensuring all is running smoothly. Skipper Brian is a sun catcher able to navigate away from rain showers for that day’s water activities. Choppy surf round the Baths? Brian, the lifeguard, will paddle board you in while giving tips to the snorkelers at the same time. He can herd goats away from the roads of Anegada, and keep a close eye to ensure you are drinking your bottle water to offset rounds of painkillers during the afternoon at Soggy Dollar with the Swedes. Alex, thank you for the adorable and delicious birthday cake. We especially miss your breakfasts and appetizer platters. We enjoyed hearing about your travels while sailing from island to island. You and Brian’s restaurant choices at St. John, Cooper Island and Anegada (with ribs for non-lobster eaters) were spot on. This crew is caring, loads of fun, and will keep you safe. Brian did way more than expected. He caught up on any hiccups we had and kept everyone in good spirits. LOVE! Apart from being a gourmet chef Alex took care of us like our mom/best friend/party buddy would be. A million thanks! Brian has been the best skipper - kept up all promises he´s made to us from taking a dingy at dawn to getting us, hard to procure reservations and tables at the places we went to. His experience has made up for our lack of preparation and ensured that we had the time of our lives regardless of crew personalities. He was able to manage a diverse group of people, appeal to their sense of fun and adventure, unite and lead when there was trouble. Alexa was awesome. She not only prepared delicious meals and kept the cabin clean, but she also told us what to expect from each day and how to prepare. She is an invaluable employee. Her future is bright! Brian and Alex are AMAZING! I cannot say enough good things about this week, Brian made us feel like a family from the first night. He made sure this week was everything we wanted and more! Alex´s meals always tasted and looked great. She provided us with great tips and advice throughout the trip. I would highly recommend her. Brian was brilliant, very entertaining, really listened to us and worked so hard to make our week the best week for us. He became part of our group and we loved having him as our skipper.